Kochi, November 29, 2012: SpiceJet Ltd, India’s most preferred low cost airline, today launched flight from Kochi connecting Maldivian capital city Male. The airline will also be connecting Kochi with Dubai from the second week of December. SpiceJet is offering daily direct flight from Kochi to Male and Dubai and inaugural ticket fares are as low as Rs 4,999 (one way fare inclusive of all taxes). This is the first international launch of SpiceJet on any international route from Kerala. 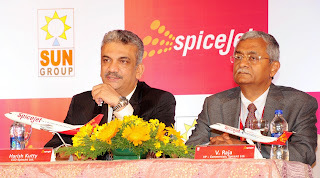 At present SpiceJet operates international flights from Delhi, Mumbai, Chennai and Madurai. Kochi has become fifth destination in India from where the airline has started international flights. Male is the capital city of Maldives and is considered a preferred tourist destination. The inaugural flight from Kochi to Male was flagged off at 12:50 pm today in a function held at Cochin International Airport. The airline has deployed Bombardier Q400 aircraft on Kochi-Male route. The Bombardier Q400 NextGen turboprop aircraft can accommodate 78 passengers and is widely accepted as the best short-haul aircraft globally. “Kochi is an important destination for SpiceJet. We are launching two international flights from Kochi connecting Male and Dubai. This is besides, our strong presence on domestic routes from Kochi. With these launches, people can enjoy affordable flights on international routes,” said SpiceJet Chief Commercial Officer Mr. Harish Kutty. SpiceJet also announced the launch of Kochi-Dubai daily direct flight from December 10, 2012 onwards. SpiceJet has been working on new destinations in domestic market as well as on international routes as the carrier has set its sights on expanding its coverage in phases on a regular basis. Under the network expansion plan, SpiceJet will also be launching daily direct flight to Dubai from Ahmadabad starting from December 19, 2012. On our Kochi – Dubai and Ahmedabad - Dubai route we will deploy our Boeing 737 -800 aircraft which have a capacity of 189. Tickets can be booked through www.spicejet.com or Toll Free Reservation at 1800 180 3333 / 0987 180 3333 and through Travel Agents. For more details on schedule and fares please log on to www.spicejet.com. SpiceJet is India’s preferred airline, with 19.1% of market share in Indian domestic market, delivering the lowest air fares with the highest consumer value. The airline currently operates more than 300 daily flights to 38 Indian cities and 4 international destinations. The city of Agartala, Ahmedabad, Amritsar, Aurangabad, Bagdogra, Belgaum, Bengaluru, Bhopal, Chandigarh, Chennai, Coimbatore, Dehradun, Delhi, Goa, Guwahati, Hubli, Hyderabad, Indore, Jabalpur, Jaipur, Jammu, Kochi, Kolkata, Kozhikode, Madurai, Mangalore, Mumbai, Port Blair, Pune, Rajahmundry, Srinagar, Surat, Thiruvananthapuram, Tirupati, Tuticorin, Varanasi, Vijayawada, Visakhapatnam and four international destinations namely Dubai, Colombo, Kabul and Kathmandu are connected using our new generation fleet of 36 Boeing 737-800/ 900ER aircrafts which are of the highest standard in safety and operating efficiency along with our newly acquired 12 Bombardier Q400 aircraft for enhancing connectivity to Tier II and Tier III cities. Through its web based reservation system, Park 'N Fly provides web-based access to a network of airport parking spots covering 50 plus airports.